And the BOOM is back! 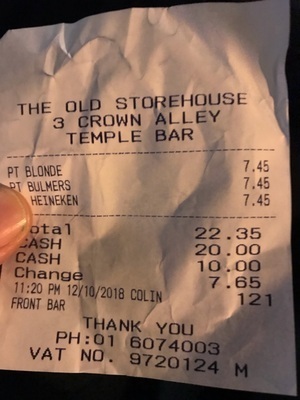 Posted in Misc and tagged pricing, Temple Bar at 10:07 am on October 13, 2018 by Chompsky. 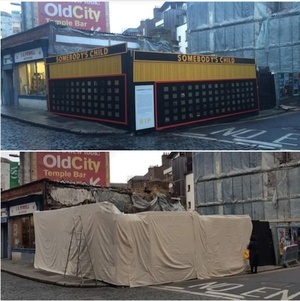 Last night the protective netting that I placed on the site at Exchange Street was torn down deliberately. 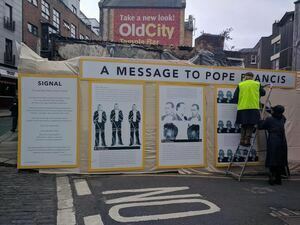 This netting was to allow us to put up a new response to Pope Francis’s visit. 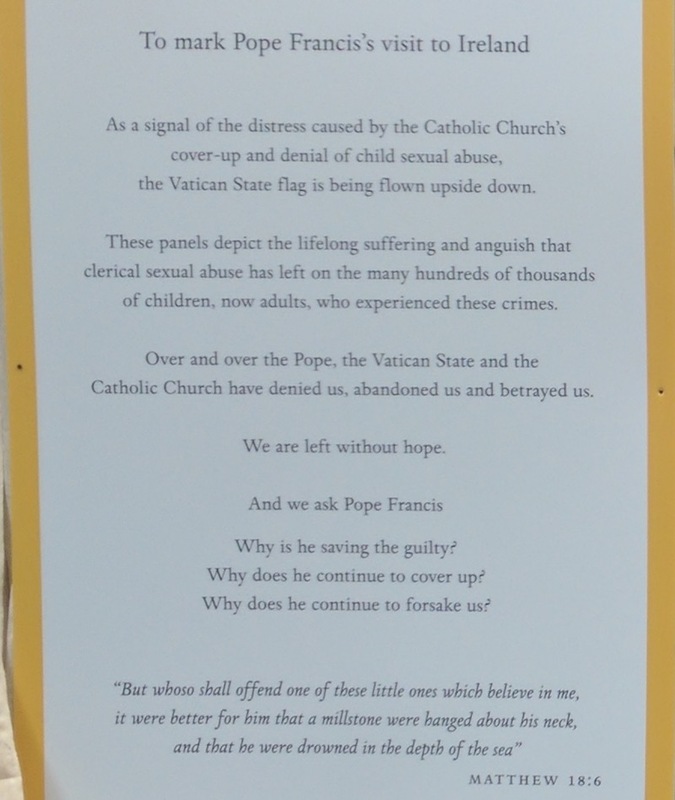 This temp piece of work (above) sends out a clear message and is in keeping with the 15-year project that we have been working on on this site. You are all welcome to visit the site today as we will be erecting the new piece at 9am this morning and we hope to be finished by this afternoon. 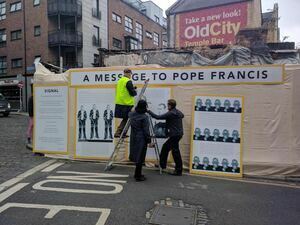 UPDATE: Mannix Flynn (in hi-vis yellow) at Exchange Street Lower, Dublin 2 this morning. Posted in Misc and tagged Artane Boys Band, Temple Bar at 10:39 am on August 23, 2018 by Bodger. 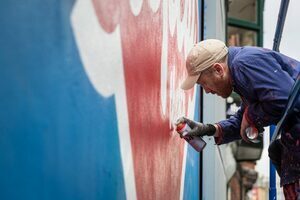 Posted in Misc and tagged Temple Bar, typo at 3:50 pm on June 20, 2018 by Bodger. 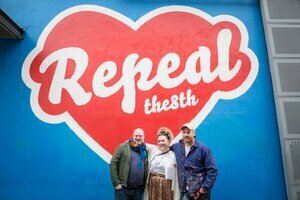 Posted in Misc and tagged Project Arts Centre, Repeal mural, Temple Bar at 3:48 pm on April 9, 2018 by Bodger. 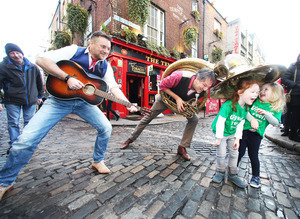 Guitarist John Piet de Klerk and trombonist Patrick Witberg from 18-piece Dutch Group ‘JP & Seeger Sessions’ help launch Tradfest, Ireland’s largest festival of Trad and Folk Music, which is currently underway in Temple Bar. 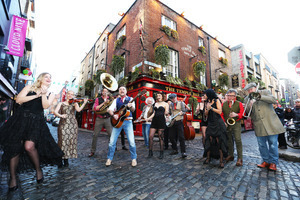 According the reasearch undertaken by Behaviours & Attitudes, “over 60% of international visitors were only in Dublin because of Tradfest”. 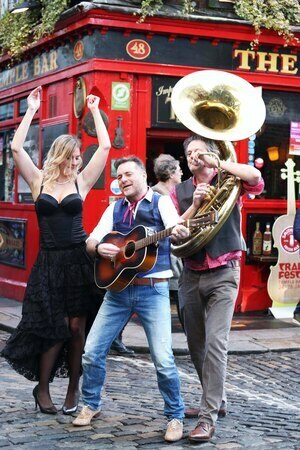 Posted in Misc and tagged Temple Bar, Tradfest at 1:46 pm on January 26, 2018 by Bodger. 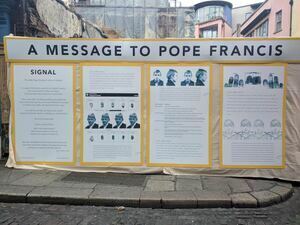 The Garda Síochána Ombudsman Commission yesterday issued a statement in which it appealed for witnesses of an incident in Temple Bar, Dublin, to come forward. A Garda is being investigated after he was allegedly caught on CCTV hitting an elderly woman with a bottle he threw. The Garda Ombudsman has launched an investigation into the incident in Temple Bar, Dublin, which also involved a pal of the cop being struck with a bottle. The off-duty officer was with two colleagues at 1.30am on Sunday when the incident happened. It is understood the three were play-acting on the street when the garda at the centre of the probe fell and banged his head. It is alleged he got up and walked on alone, followed by his colleagues, when he was captured on CCTV crossing the street and shouldering a man who was standing with another lad. A source said: “A row ensued, the cop in question picked up a bottle and fired it at one of the men. He missed and hit the elderly woman. He was also seen punching another fellow. An investigation is under way into a violent incident in which a garda suffered serious facial injuries. The Dublin-based officer, who was off-duty at the time, had a bottle smashed over his head. GSOC, the Garda Siochana Ombudsman, is investigating the incident which happened in Temple Bar shortly before 1.30am on Sunday. 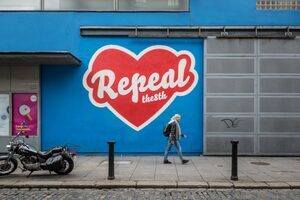 The garda suffered a fractured eye socket as well as injuries to his head and arm tendons during the incident on Fleet Street and needed hospital treatment. Five men including the injured officer were allegedly involved in a confrontation that happened when a night out turned sour. Two north inner city Dublin men were arrested at the scene, outside Gallagher’s Boxty House. They are aged in their late 20s and early 30s and both are well-known to gardai. Sources said that during the course of the incident, a bottle was thrown by one of the men involved. 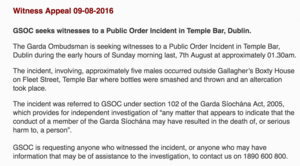 Posted in Misc and tagged GSOC investigation, Temple Bar at 3:36 pm on August 10, 2016 by Broadsheet. Temple Bar, Dublin, this evening. Don’t see a great night wasted..
Posted in Misc and tagged Dublin, Temple Bar at 8:27 pm on April 25, 2015 by Aaron McAllorum. 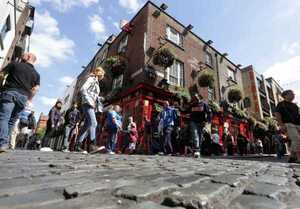 Temple Bar, Temple Bar, Dublin. 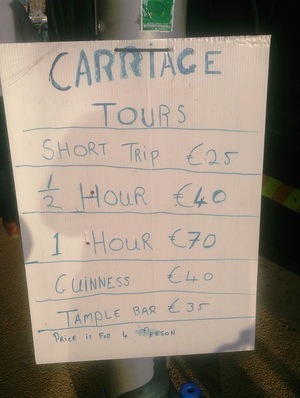 The ‘How Much?’ tourist mecca. 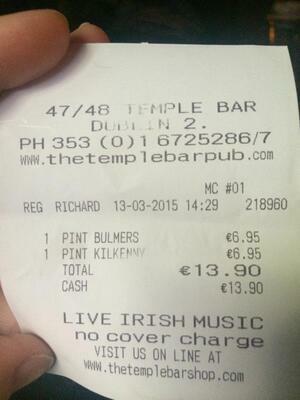 A complete and utter rip off…..
Posted in Misc and tagged Temple Bar at 5:05 pm on March 13, 2015 by Admin. 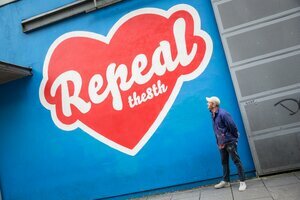 According to the new chairman of Failte Ireland, Michael Cawley, the famous and historical cobblestones on some of Temple Bar’s streets may have to go, as some tourists wearing high heels find it difficult to walk on them! Mr Cawley, who is a former Deputy Chief Executive of Ryanair, was speaking on the RTE Business Show this morning…. 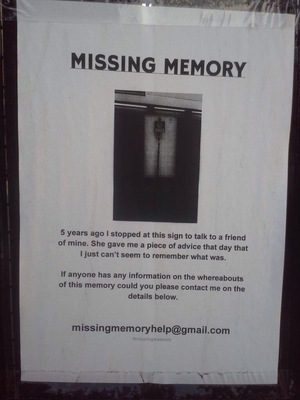 Posted in Misc and tagged Cobblestones, Temple Bar at 12:12 pm on October 25, 2014 by Broadsheet. 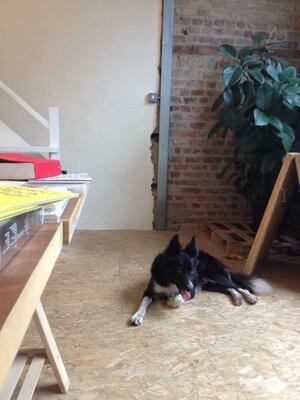 Posted in Misc and tagged Found dog, Temple Bar at 11:34 am on September 1, 2014 by Broadsheet.